The designation “-otron” is much more versatile than you might originally think. Consider, how would you watch replays at your favorite gridiron team’s stadium without a jumbotron? Or, how would you research the most hilarious quotes and make the dankest memes without the online Futurama repository Morbotron? Then of course there’s the O’Tron clan from County Cork, Ireland. And how else would you answer the question, “What was the name of that movie we watched over at Steve’s the other month, the eighties one where the guy got trapped in a computer game or something?” “Oh, ‘Tron,’” of course. This -otron, without ANY connecting text, just hanging off the end of its hyphen as if it was dangling by a scrappy vine on the edge of a precipice, is a UK producer of seasick techno, guaranteed to fracture your field of vision like a boulder to a windshield … but in color! “Prism Exhilarated” is a “sampletronic” odyssey into the furthest reaches of deep, or inner-, space. Tracks like “Gemini” ping through the terminals of spaceports, transmissions from pilots and astronauts and other people more in charge than me penetrating the electronic mayhem. Tracks like “Geometry4U” burble and burst and make you feel like you should have paid more attention in high school. Its samples feel condescending to me because I’m math stupid. But wait, there’s more to it than just that! [“Prism Exhilarated”] is … the world’s very first album release to integrate Soundary’s Prysm technology. … Prysm is a unique duplication system, ensuring that every copy of an album is sonically different from every other. 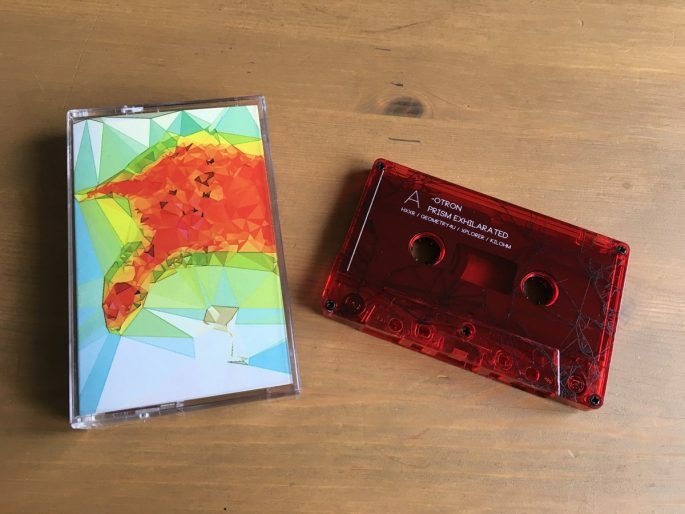 Thus, when you buy Prism Exhilarated on cassette you are purchasing a unique musical artefact available to no-one else. It is the ultimate collector’s edition. Wow! The self-released edition of 49 cassettes is available from -otron’s Bandcamp page, where you can also find “’reference’ digital rendition (the effective copy 0), which is included with each cassette and also purchaseable as a standalone download.” I mean, you’re essentially getting two tapes when you buy one. Or 49 different tapes when you buy all 49! Are you that brave?